We help customers to maximise the utility of older equipment. Our tricks for refurbishing, modifying and extending the usable life of equipment work well for less demanding cyclists for several more years. But if you want the latest and best equipment; tell us and we happily supply it at competitive prices. We do not require fixed appointments for bicycle service; it is easy for our customers to drop off their bikes for repairs any time. 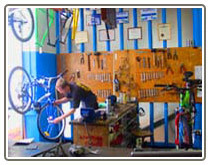 Cleaning, saltwater removal and rust protection treatment are included with all our bicycle service work.